The Wabbit was disgruntled. "What's this for a sort of restaurant?" he asked Lapinette. "It's what was open," said Lapinette, "but there's no-one here." 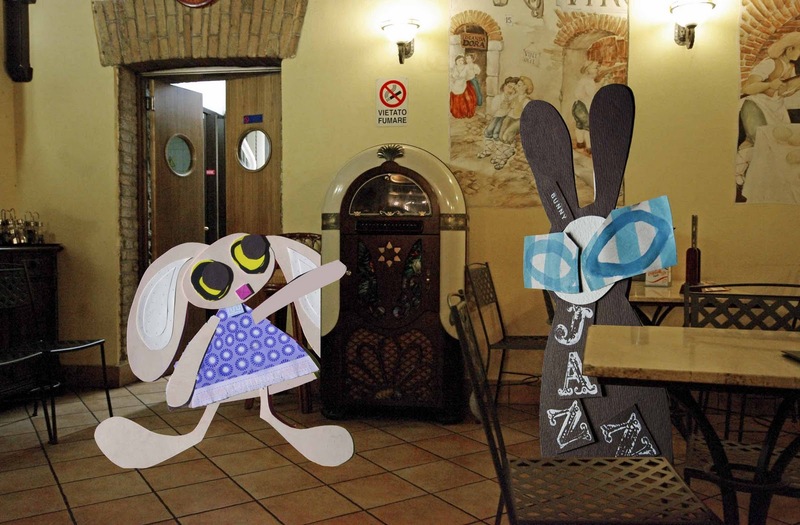 "I'm not entirely surprised," said the Wabbit. For a while he hopped around looking for a waiter. "Hello hello!" he cried," but there was simply no answer. "Perhaps they've all gone for a break," said Lapinette. "Hmmph," said the Wabbit, "what's on the juke box?" Lapinette had a good long look. "Nothing you'd like," she said. "There must be something," said the Wabbit. "I don't think so!" said Lapinette sharply. "Try me," said the Wabbit. "Una Paloma Blanca?" suggested Lapinette. "Yikes!" said the Wabbit and his fur stood on end. Lapinette studied the play list again. "Vamos a la Playa perhaps?" she asked. "Baila baila ho!" groaned the Wabbit and slapped his head with a paw. "Tie me Kangaroo Down by Rolf Harris, Cha Cha Cha version," said Lapinette. "I don't think I have any C4 explosive left," said the Wabbit. "Found one!" said Lapinette. "Lets have it," said the Wabbit. "It's Charlie Drake," announced Lapinette as she dropped an emergency coin into the slot. "Oom yacka wurka. Oom yacka wurka," chanted the Wabbit and he beat his paws on the table to the music. "Lets get out of here," said Lapinette, "I know somewhere else." "I'm a big disgrace t' the Waborigine race," sang the Wabbit. "Your boomerang won't come back!" sighed Lapinette as she dragged the Wabbit away.